The United States Society on Dams (USSD) is dedicated to advancing the environmentally sustainable science of planning, design, construction, operation and maintenance of dams, levees and associated civil engineering practice. As the premier source for technical information, USSD provides a forum for the exchange of knowledge and experiences, and is charged with leading the profession of dam and levee engineering. The annual USSD Conference and Exhibition—the organization’s largest event—attracts 700 attendees. Content for the technical program is sourced through an open call, which has been generating an increasing number of submissions each year. Historically, staff has handled the entire submission and review process manually through email and spreadsheets, which was an adequate solution initially. As the conference grew, however, this process became unmanageable. Additionally, USSD staff began receiving feedback from submitters who were used to using a more streamlined, online solution at other conferences. USSD performed their due diligence, researching a variety of options that ranged from more basic, do-it-yourself solutions to full-featured systems. The organization determined that they wanted a more comprehensive system that could be configured to their specific processes, thereby eliminating as much manual work as possible. 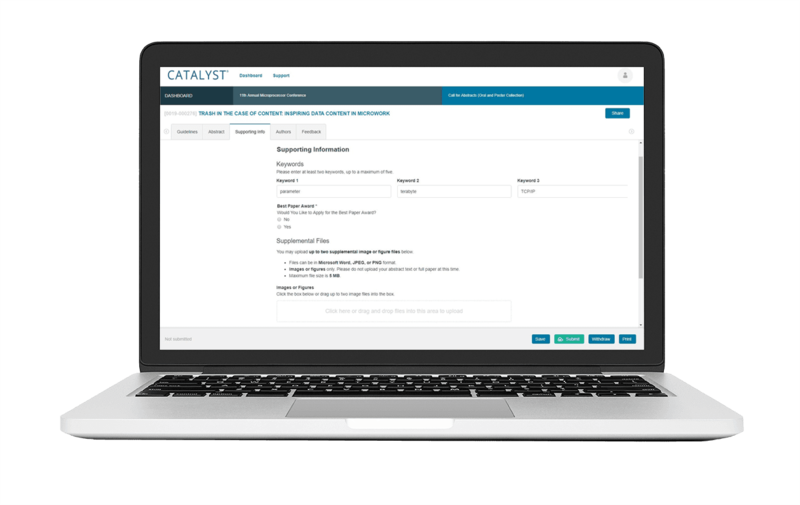 USSD ultimately chose CATALYST for its flexibility, ease of use, and because they knew they would be fully supported by their Omnipress project manager. With their paper submission and review process now automated, USSD staff is no longer spending time on low-value tasks such as managing communication with submitters on a one-by-one basis. Instead, they can focus on continuing the growth of their flagship conference.